I decided to change my "way of posting" to a more regular basis. It won't be ALOT more music, since I won't do as many monster posts anymore. I'll generally post on one artist or style per post, making it easier for MOG and such. 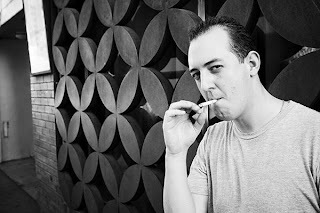 I'm pretty sure you guys don't know a thing on Wolfgang Gartner. He's one of the very, very, VERY hot producers right now that nobody knows about (what the hell). He's been pumping amazing beats lately and I came across his newest releases that you'll probably enjoy. How would I describe his music? Groovy (PERIOD). You know the type of music that makes you feel cool for a moment? Well that's it. (Even if you're a big fat nerd with no life, it'll work, trust me.) I don't know if you remember but I posted one of his track a couple months ago here and I still think it's an amazing track (the name is Flashback). So here are a couple of his songs that you'll really enjoy, I hope. Feel cool for a couple minutes, baddies. Yeah I know... this song title got sexually abused. It fits this one though! This is his latest release and it's... fawking hawt. Wolfgang Gartner is clearly in Justice's range (musically), too bad he's missing style and a partner. Buy his stuff here(Beatport). I have this mashup of the songs Flashback and Mars (from Fake Blood) that is pretty much full of awesomeness. Fake Blood is pretty much like Wolfgang Gartner: they aren't exactly popular, but their music rocks. You probably heard the original song Mars from Fake Blood somewhere: it got remixed so many times. Here is the track. If you didn't hear any of the two songs, you probably won't notice it's a mashup. Like the title right? hah. This entry was posted on Tuesday, September 8, 2009 and is filed under Denzal Park,Fake Blood,Wolfgang Gartner. You can follow any responses to this entry through the RSS 2.0. You can leave a response.